If you're a beauty junkie like me, you've probably seen about a million makeup swatches scrolling through Instagram. Here's how it goes: Another day, another lipstick launch, another square-shaped swatch graces your feed. That is, until makeup artist @stellasabina_artistry decided to take swatching to a whole new intricate level, creating a work of ~freaking art~ — I'm talking mural-status — out of shades from Kat Von D's Everlasting Liquid Lipstick collection. MIND. BLOWN! Are you equally artsy or just feeling super-creative? Here are the shades Stella used to execute these beautiful blooms: Backstage Bambi, Ayesha, L.U.V., Damned, Outlaw, A-Go-Go, Echo Supreme, and Requiem. I don't know about you, but my mind is legit blown—but I'm not the only one impressed by Stella's artwork. 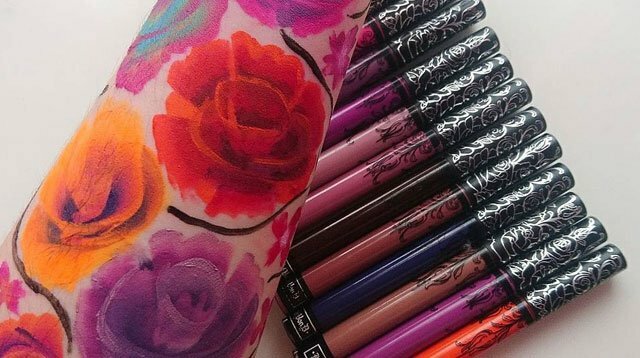 Popsugar pointed out that her picturesque swatches have picked up major steam and were even reposted on Kat Von D Beauty's Instagram page. You go, girl! Lipstick swatches have never looked so good. Is this the start of a #SwatchChallenge? If so, I'm here for it!